A daredevil pilot in the famed 352nd Fighter Squadron, the author of this remarkable memoir bailed out of his burning Mustang on D-Day+2 and was launched on a thrilling adventure on the ground in Occupied France.After months living and fighting with the French Resistance, Ted was captured by the Wehrmacht, interrogated as a spy, and interned in a POW camp and made a daring escape just before his deportation to Germany. Nothing diminished this pilot s talent for spotting the ironic humor in even the most aggravating or dangerous situations, nor his penchant for extracting his own improvised and sometimes hilarious version of justice. A suspenseful WWII page-turner and an outrageously witty tale of daring and friendship, this book brings to vivid life the daily bravery, mischief, and intrigues of fighter pilots, Resistance fighters, and other Allies in the air and on the ground. The author recorded his swashbuckling adventures at age 24, after his discharge and return to the States. Afterward he went into business and never again put pen to paper. But his immediate reminiscence of his wartime experience recently found reveal a literary talent that is rare.REVIEWS the finest example of the classic World War II evade and escape story a 1940s masterpiece with a heart and soul unlike anything that's been published a unique contemporaneous treasure that historians, linguists and social experts will study for years to come. Jay Stout, Author of Fortress Ploesti The Campaign to Destroy Hitler's Oil Supply A fascinating memoir, discovered by the author s daughter after his death. World War II Magazine, January/ February 2013 Get to know one of the more rambunctious members of the Greatest Generation with this memoir by Ted Fahrenwald, a young daredevil fighter pilot of the 352nd Fighter Group. The memoir was written immediately after WWII when Fahrenwald, an aspiring journalist, was only 24 years old, and was only recently discovered by his daughter after Fahrenwald died in 2004. The gregarious flyboy describes getting shot down on his 100th mission two days after D-Day and being helped by French resistance fighters. 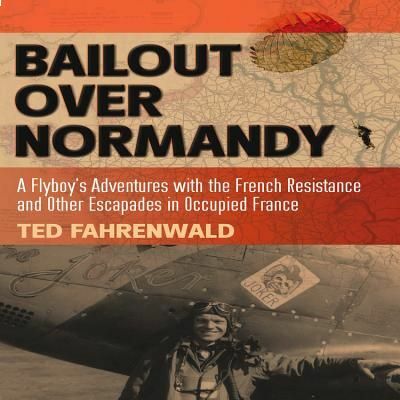 Between bouts of drinking and carousing, Fahrenwald participated in raids with the French resistance until he was captured by Germans. His adventures are written in a lively, conversational style with a hearty dose of humor, with politically incorrect vernacular preserved as written. Book News There is no re-writing of history here; told in a self-effacing style filled humor and irreverence, the reader gets Fahrenwald s story unfiltered, with neither preaching nor rationalization. This is a true-life World War II adventure story of the highest order. Eagle Eye, the newsletter of the Association of the 4th Fighter Group. thoroughly enjoyable memoir simultaneously engages and entertains the reader Fahrenwald s memoir is a nerve wracking three month journey. His wit and humor come through in his writings. He is at once ribald and evocative. Military Review is a brilliant snapshot of a terrifying, treacherous period in world history as told through the eyes of a daring young man who not only had the resourcefulness and smarts to survive for three months behind enemy lines, but had the foresight to write it all down, in splendid detailDaily Southtown a good read and a worthy addition to the World War II memoirs of those who are passing into history at a high rate incredibly descriptive, vibrant and blunt style makes the narrative serves well as yet another testimonial of men at war and a triumph over adversity, while also providing an outstanding look at the French Maquis and their interaction with rescued aviators recommended. Journal of America s Military Past.